Usually in habitats similar to those of our other common species, L. americanus, and often growing with or near it; shores, swamps (cedar, tamarack, hardwoods); wet prairies, fens, bogs; ditches, borrow pits, ponds; wet thickets, meadows, stream banks. Some calyx lobes, especially on fruiting material, may be as long as 1.4 mm but still without exceeding the nutlets. Specimens from Gratiot and Huron Cos. have been annotated as L. ×sherardii E. S. Steele, a hybrid with L. virginicus; these look like robust L. uniflorus although the ends of the nutlets are a bit more toothed than usual. One specimen from Muskegon Co. and one from Ontonagon Co. appear to be similar and in each case both species were also present nearby. 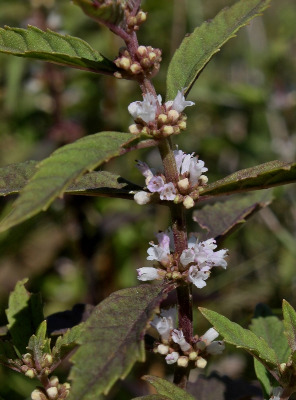 A collection from Lenawee Co. (R. W. Smith 1900 in 1986, MICH) has the short calyx lobes of L. uniflorus but smooth nutlets (and pinnatifid lower leaves) of L. americanus and is presumably a hybrid. Some collections from Monroe Co. (E. G. Voss 14902 in 1976, MICH; A. A. Reznicek 7839 in 1986, MICH, MSC) have the vegetative aspect of L. asper but the calyx and nutlets of L. uniflorus. MICHIGAN FLORA ONLINE. A. A. Reznicek, E. G. Voss, & B. S. Walters. February 2011. University of Michigan. Web. 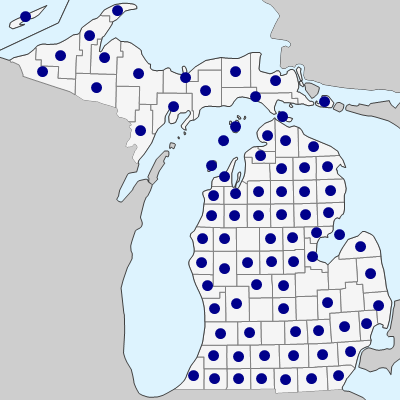 April 24, 2019. https://michiganflora.net/species.aspx?id=1561.